Organized since 2003, on the foot hills of the heritage site, Dhauli, the Mahotsav, has created a place for itself in the cultural map of the country. 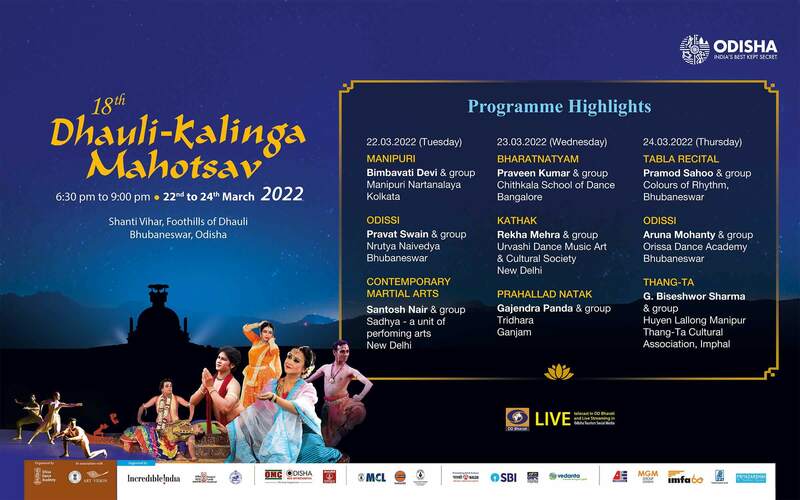 Hosting nearly 500 artists from across India, the Mahotsav stands apart as one of the most prestigious and diverse festivals to be held in Orissa. As a Buddhist heritage site, Dhauli serves as an ideal place for celebrating India’s legacy of cultural coexistence and we take great pride in promoting its tourist potential. The Annual Dance Festival , termed as Nrutyambada, is held every year in May. All the students of Orissa Dance Academy participate in this Festival held for two days. This Festival gives an opportunity to every student to perform on stage and sincere effort is made to exploit their potential talents. Solo dance has been the core strength of Indian Classical Dance forms. Solo artists are instrumental in bringing classical dance to the forefront of India’s cultural arena after independence. As popularity of group dances have decreased the opportunity for solo performances, Orissa Dance Academy has incorporated a Young Dancers’ Festival in its annual calendar. Thus Udayaraga is an humble attempt to provide rasikas , students and art connoisseurs with a forum to enjoy the true spirit of solo presentation. As an important feature, an interactive session is included in the morning after the performance in which artistes express their thoughts on their performances. This session is titled as Bahirangam.